2018: In two games (two starts), Cooper recorded 25 carries for 144 yards and six receptions for 44 yards and one touchdown. 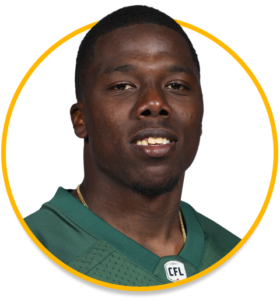 Cooper started his first CFL game in Week 10 where he finished with 17 carries for 102 yards and five receptions for 41 yards and one touchdown – his first in the CFL. Cooper finished the season on the club’s practice roster. College: Cooper attended Fort Hays State in 2012 and 2015-16 after redshirting the 2011 season. He appeared in 35 games recording 456 carries for 2,768 yards and 19 touchdowns while catching 73 passes for 736 yards and 10 touchdowns, and returning 22 kickoffs for 452 yards. The Don Hansen Football Committee named Cooper an All-America Honourable Mention at running back and he also earned All-MIAA First-Team Honours in his 2015 season.